Pie is a theme in my life. I come from a pie-baking New England family. I started when I was in high school when my mom and my grandmother took me step by step through making a pie. My mom and grandma passed along their secret pie tip. They told me to fill it with more apples than you�d think you possibly could, because when the apples bake down the pie will look normal height. If you put in a rational amount of apples, the pie will sink and look like you skimped on the main ingredient. As a teenager I entered one of my first pies in our small town grange fair. The next day when they threw the fair doors open, I was thrilled to see a blue ribbon on my pie! My grandmother�s close friend, Willow Steadman (I still remember her name), had won the apple pie blue ribbon for many years. Mrs. Steadman told my grandmother she was so happy that young people were learning to bake champion pies and congratulated her on teaching me so well. My grandmother and mom, bless their hearts, beamed. I still have that blue ribbon. That early praise must be what got me stuck on pie baking. Ever since I�ve loved making pies. I decorate them with cutout stars and hearts or poke words (Love, Enjoy, Yum!) into them with fork tines. Here on the farm I gather fruit from the fields -- cherries in June, blueberries in July, blackberries in August, apples in September and grapes once the frost kisses and sweetens them. Last week Joseph and I and our friend Jake picked three big baskets of purple grapes. Joseph wedged the orchard ladder up against the shed so I could get the grapes that grow up over the roof peak. Jake and Joseph stripped the grapevines that leaped across from the arbor into an apple tree. I stood at the top of the ladder, my head under leathery, green, hand-size leaves, picking fragrant purple clusters, then poking my head through the leaves to scan for deer, hawks, cats in the field, from my high perch. Picking for a pie is half the fun of making them. Grapes make a wonderful pie, sweet, dense and heavy with the scent of fall. When I was in my 20s I discovered a grape pie recipe in my grandmother�s 1800s cookbook that said to deseed each grape, so I spent two hours cutting a huge bucket of juicy grapes in half, removing the seeds and staining my fingers deep purple. I didn�t know then there is a tool that can deseed a bucketful in just a few minutes! Joseph and I make lots of pies. He does the crust and I make the insides and decorate the top. While I can be creative inside the pie, I admit that my husband, hands down, makes a better crust because HE can follow a recipe's directions, which is something I don't do well. For the past few years my stepmom, June (June writes the recipe column here at Friendly Haven) and my dad have come out to Washington from Florida to help us pick and can our garden harvest and fill the freezer with pies. In the midst of a kitchen full of simmering spaghetti sauces and bubbling blackberry jam, June somehow manages to make about 30 pies. When June says she�s made thousands of pies, she�s not kidding. She�s a one woman assembly line. In the country, pies are the language of friendship. Pies attend potlucks and parties, arrive as gifts, and if you�re ever pulling up my driveway unannounced, there�s a good chance that before you reach my front door, a pie will have just moved from the freezer to the oven to bake while we�re setting and talking. Years ago Joseph and I lived in Seattle for three years. I�d always lived in a small town up till then. We got a house in a neighborhood so I didn�t think it would be that different, but one day I learned how foreign city life is. I noticed a new neighbor moving stuff in the house diagonal to us so I immediately baked a pie. I strolled on over midafternoon and knocked on his door. He opened the main door -- but not the screen door -- and looked at me suspiciously. He stared at me, clearly not understanding what a neighbor with a pie means. He opened the screen door, took the pie, said, �Thanks,� and closed both doors. Imagine a cloud of question marks over my head as I stood wide-eyed on his front steps. So I walked back over to our house and announced to Joseph that we surely aren�t city people and maybe we ought to move back to a small town again. I couldn�t believe that my new neighbor wasn�t versed in pie etiquette: When someone shows up at your door with a pie, you open the door and invite them in, sit at the table, each eat a piece and get to know each other. Pie, when used properly, sticks neighbors together and everyone where I come from knows pie etiquette. Pie is made to be given away, or eaten with friends. Last weekend we had our fourth annual Apple Pie Party. 18 apple and peach pies got made by our friends and neighbors. Even after herds of deer move through each evening we still have plenty of apples, so in October we have a party to share our bounty with our neighbors. We make invitations and walk all over the neighborhood passing them out. We tell everyone to bring a potluck dish and an empty pie pan. On party day we borrow long tables and old wooden benches from our one-room schoolhouse and set them up in the yard (or, because it rained this year, in our kitchen and living room). I pull out my collection of antique table cloths and put a bouquet of colorful dahlias on each table. The first table is for making pie crusts. The next table has apple peelers and corers, including a fancy old handcranked machine that peels, cores AND cuts the apples into spirals. The kids especially like fiddling with that one. The last tables are for the potluck. We all set around talking and watching kids bob for apples in a big tub while we compliment each other�s potluck contribution. At our pie parties we have a mix of all ages and MANY pies get made. I especially love watching our elder neighborhood women, all pie experts, teach kids how to make their first pies. The photo you see at the top of the page is from last year�s pie party. 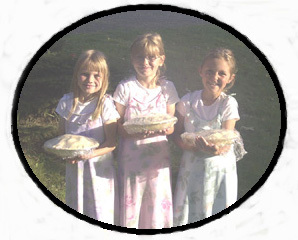 These three girls, Rachel, Emily and Bethany, all sisters, each made their first pies here. When everyone has left, usually around dusk, Joseph and I clean up. We toss all the tablecloths in the washer, wipe down the tables, and cart the buckets of apple cores and peels out to the side orchard, over by the pond, and spread them out for the deer that evening. If we wait quietly, like we did this year, we see the does and their fawns browsing the scraps, fattening up for winter. No matter how many pie slices we�ve eaten that day, Joseph and I always have yet one more piece of pie before bed and, living up to an old New England tradition, we wake up the next morning and have pie for breakfast. I hope your season is full of a harvest of abundance in every way possible.